After Acquired Chongqing Road Test License, What is the Next for Roadstar.ai? Even the robotaxi might still far from being realized, the technologies developed can be utilized in some scenarios. At least, autonomous parking will be a piece of cake for roadstar.ai. Roadstar.ai has been valued at USD 530 million since its series A financing of USD 128 million. Roadstar.ai established in 2017 when most smart driving startups coming in bundles. Current famous smart driving solution startups including Momenta, Pony.ai, and TuSimple were founded at two to three years ago. However, there is still a long way for autonomous driving to go. Pony.ai has launched its self-driving fleet car-hailing service in Guangzhou, China. Though the bold try is only limited to a small school of people (the seniors of Pony.ai and its VIP customers), the future of self-driving is yet to be determined. Last year, roadstar.ai debuted its first generation Level 4 solution, Aries-Rui (Aries.锐) and demonstrate the feature of multi-sensor fusion framework in Asia CES 2018. By far, the latest Level 4 solution is Leo.Ling (Leo.灵). 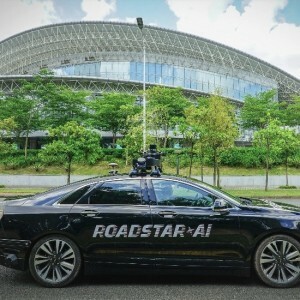 Early this month, roadstar.ai acquired Chongqing ‘s autonomous driving road test license, where the city is the most difficult road test place which covers over 85% of the road scenarios. The most challenging part should be hill driving and curving, and hence correspondently requires that test cars are skilled in these driving scenarios. Besides, Chongqing’s automobile plants (also called "OEM") can provide a friendly environment for autonomous driving solution companies to assemble their test cars. At least, getting the license indicates that roadstar.ai’s autonomous level is approved to be on test road. From website’s demo and other resources, roadstar.ai’s Level 4 solution can be applied into real operation, especially when it appeared in Wuzhen and provided robotaxi for WIC (World Internet Conference). Founders of roadstar.ai want to realize an autonomous driving robotaxi fleet based on their integrated autonomous driving solutions to minimize the human costs and lower the accident frequency. However, to land its solutions into real practice might still take years or even decades to do. Even the investment heat can project the expectation of autonomous driving – the investment number dropped from the peak 2016’s 140 to 80 until November 2018. Being far from landing and due to the cooling investment heat, the autonomous driving industry is facing a living crisis. According to the news release at the end of December 2018, Momenta was said to cut 60% projects and move R&D center to Suzhou. Momenta is also a company developing autonomous driving solution who just receive USD 200 million strategic financing in October 2018. But after discovering the difficulty in landing its “Smart Driving Brain” into the real market, it started to cooperate with OEM in autonomous parking while it has no original and systematic sensor solution like roadstar.ai does. Comparing to Momenta, roadstar.ai is valued at only 54% of Momenta, who valued at USD 963 million. Though both are branded as autonomous driving solution companies, what they do deviate from each other and roadstar.ai is the one professional in sensor solutions. Roadstar.ai’s sensor solution is well-praised by the industry and its successful try in WIC demonstrated the capability of the sensor solution. The multi-sensor fusion is composed by liDAR, camera, milliwave radar, and GPS, etc. The integrated sensor system provides multi-dimensional perceptions of the car’s surrounding environment and hence assists in central decision making. Indeed, during WIC, the weather of Wuzhen, where the conference held at, was rainy most of the time, but roadstar.ai’s robotaxi fleet fulfilled the duty with zero mistakes.